The Algarve is synonymous with natural beauty and during your visit you must be sure to explore the Ria Formosa Nature Park and its heavenly islands. Considered one of the seven natural wonders of Portugal, the Ria Formosa, as the locals like to call it, is a protected area extending along 60 km of the Algarve’s coastline. It consists of a unique lagoon system that is constantly changing due to the effects of currents, winds and tides. You can go on foot, by bicycle, Segway or boat to discover endangered species such as chameleons, seahorses and purple swamphens, which breeds exclusively in these Algarve lakes. 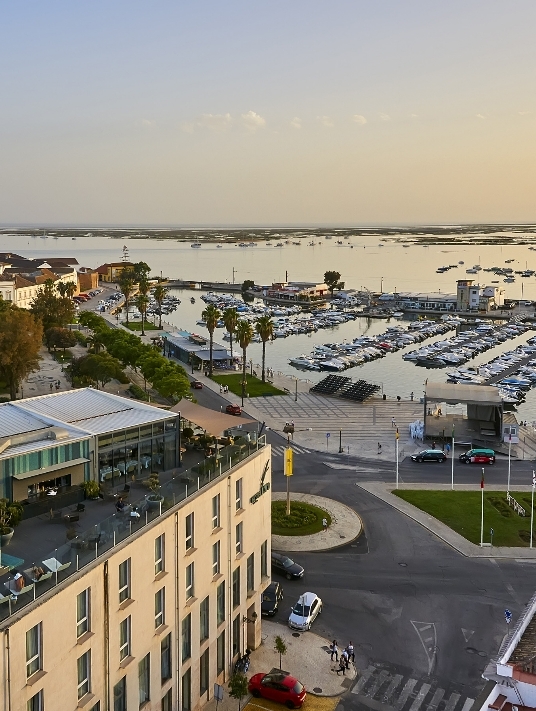 The friendly team at the Hotel Faro will be delighted to help you organise your expedition and we definitely recommend you take a boat trip through the Ria Formosa to the fantastic islands with their golden sandy beaches and crystal-clear waters, where you can relax. Did you know that over 300 species can be seen here? There’s more to the Algarve than beaches. In fact, the region is one of the most interesting in the country for birdwatching because more than 300 species are to be found here during the course of the year. Birds of prey, sea birds, waders, ducks, passerine birds and many others contribute to the rich diversity of this ornithological sanctuary. The Ria Formosa and the Castro Marim Marshes, in particular, are places where you can see quite rare birds such as purple swamphens and Audouin’s gulls. There are some fabulous trails between Faro and Quinta do Lago, which feature special shelters for birdwatching. How to get there? We suggest you go by Segway, which is a very different way of experiencing nature, to say the least! What connects the sea to the uplands in the Algarve? There are 33 walking trails between the sea and the uplands. Properly identified and signposted, they will give you the opportunity to explore a different Algarve. On the island dunes, the trails through the marshes and the craggy hilltops of the uplands, the Algarve’s natural heritage is vast and varied, and you can see a number of species, some of which are endangered. Whether you go on foot or by bicycle, these trails also give you the chance to come into contact with the region’s people and traditions. The southern coast, the Vicentine coast, the Barrocal, the uplands or the Guadiana... the choice is yours. If you can’t make your mind up, the Hotel Faro’s team is on hand to help. Do you like eco-friendly vehicles? If you are a nature tourism enthusiast, you must be sure to explore Faro, the Parque Ribeirinho (waterfront park) and the Ria Formosa Nature Park by bicycle. The Hotel Faro’s team will be delighted to help you hire a bicycle you can discover the fauna and flora of the Ria Formosa Nature Park. Or you could use your eco-friendly vehicle to go on an expedition of discovery to Faro Island, where you will have the opportunity to admire the magnificent sunset. Have you ever heard the expression “Time and tide wait for no man”? Since our hotel is located in a land of seafarers, it would be remiss of us not to suggest that you embark with the Hotel Faro on a unique experience to visit the heavenly islands and beaches of the Algarve. The Algarve has a beach to suit every taste. The coastline stretches for some 200 km and along it you will find islands, bays, cliffs, caves and massive golden sandy beaches bathed by calm, crystal-clear waters. The people are laid-back and friendly and the beaches are very safe, the majority of them flying the European “Blue Flag”, signifying quality. Whether you choose to go on the Hotel Faro’s own boat or prefer to take a trip with one of the many tour operators, the important thing is that you take the plunge and surrender to the delights of the fantastic scenery along the Algarve’s coast. How about seasoning your dishes with salt flower? Sea salt production not only makes the Algarve landscape unique but also produces the best seasoning for an already diverse cuisine. Precisely where the fresh water of the river and the salt water of the sea meet, huge white gardens appear, consisting of small, shallow tanks containing salt water. When the water evaporates, it leaves behind a layer of salt crystals. And if the landscape is unique, the work of the salt-gatherers is no less so! The craft, the gestures and the tools are handed down from generation to generation in a region where the activity is an ancient one that is well worth discovering. What do purple swamphens, seahorses and chameleons have in common? Discover our special offers that include trips through the Ria Formosa and visits to the islands.